Streetscape mailbox posts include standard mailbox posts, basic mailbox posts, newport mailbox posts, capistrano mailbox posts, craftsman mailbox posts and quad newport mailbox posts. Feel free to contact us if you have any questions. A product expert is ready to help you find the Streetscape mailbox post that's a perfect match to your Streetscape mailbox. 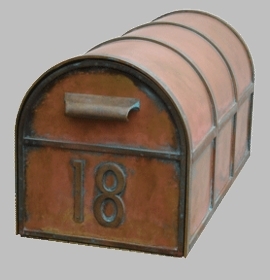 Question: Can I combine the craftsman mailbox post with the larger oxford brass mailbox? Answer: No, this post is designed for the Westchester mailbox only. Question: Do you have a mailbox that would resist vandalism from teenagers? I am tired of teenagers coming by on joy rides hitting with bats or large side mirrors. Answer: Please take a look at this Mailboss Ultimate High Security Mailbox. This mailbox is our most vandal-resistant box. Thank you!